Ko Ngai (เกาะไหง, sometimes referred to as "Ko Hai", is an island district in Krabi Province, but actually it can better be reached via Trang on the Southern Andaman Coast. Like many other coastal destinations in Southern Thailand, it is known for its diving and long white beaches. Ko Ngai (Hai) is a tiny island measuring 4 kilometres long and 2 kilometres wide. Mountainous and covered by tropical forest, much of the coastline is indented with rocky headlands, while the eastern part has some beautiful sand beaches, and in the south coconut plantations and more beautiful smaller beaches. The island has a white beach and clear water and is surrounded by magnificent corals. Don't be surprised to see crab-eating monkeys and monitor lizards coming down from the mountains. In the uninhabited western and northern parts of the island, bird watchers should have a field day looking out for migrating birds. Snorkelling is easy along the western and southern coasts, where some reefs can be accessed directly from the beach. Ko Ngai or Ko Hai (เกาะไหง) is an island that is actually in Amphoe Ko Lanta of Krabi but it is classified as a tourist destination off Trang as it is easier to get there from Trang, from Pak Meng Pier, located 15 km away on the mainland opposite, in Trang Province. Standard ferries take about one hour. A boat can be rented for 1,500 baht (10 people) and 6,000-10,000 baht (for 20-40 people). A faster speedboat connection from Pak Meng Pier is also available, departing around the same time. It takes just 20 minutes. From Ko Lanta there is a scheduled ferry service to Ko Ngai and it is also possible to rent a private longtail from Saladan (Ko Lanta) during high season (Nov - April). Another possibility is to buy an snorkelling trip from Ko Lanta and leave the boat at Ko Ngai. From Bangkok, Nok Air offers three-daily flight+ferry services from Bangkok to Ko Ngai v.v. by flying with Nok Air to Trang and transferred on a ferry to Ko Ngai. This can be booked directly from their website. There are no roads on the island, so getting around from one beach to another is done on foot, or longtail boats that can be hired at the resorts. There is a foot path (jungle trek) from the main beach on the east to two beaches on the south, the westernmost of which has Ko Ngai Paradise Resort. From there, you can follow a path that goes to national park headquarters area and then to a hill with a two viewpoints. Enjoy the view from the main (east) beach to the karst outcrop islets. Chateau Hill has great views from its uphill pool area. Apart from diving and snorkelling, the hills on Ko Ngai offer some spectacular jungle trekking amongst virgin jungles. Take a kayak and see the island from the sea at a distance. Most of the resorts offer trips to nearby islands for sightseeing and snorkelling. Emerald Cave on Ko Mook is one of the more popular attractions. All the resorts have restaurants that serve fresh seafood, Thai, and semi-Western dishes. Thapwarin Resort has a notably good restaurant with friendly staff and high quality cuisine with wide selection of dishes. Fantasy Resort boasts an impressive-looking restaurant. All resort restaurants sell beer, many of them offer wine as well. CoCo Cottage has a bar with a long selection of cocktails. Chateau Hill Resort Deluxe resort with a style inspired by contemporary art. Amid tropical forest, near tranquil beach. Prices range between 2,300-5,250 baht. Coco Cottage Resort  White sandy beach and crystal clear sea water. Rates from 1,300-4,850 baht. Koh Hai Camping Large tents instead of hotel rooms, shared simple showers. Located on the main beach, near the Fantasy Resort. [email protected] +66 81 7288317. Koh Hai Fantasy Resort and Spa  Rates, 1,200-7,800 baht. 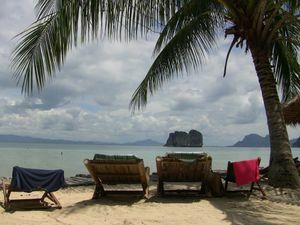 Koh Ngai Resort  Wide range of activities including scuba lessons, diving tours, snorkelling, sea canoes. From 1,200-16,000 baht. Light My Fire Society, between Thapwarin Resort and Ko Ngai Cliff Resort. North End of The main beach (walk north on the beach as far as you can until you see the drift wood sign on the beach). checkin: Anytime. 100B for your own tent, 150-200B to rent tent. edit Owner-managed by a man called Don, this is the cheapest place to sleep on the island. The tiny bar made of drift wood has a chilled out vibe. Meals are shared together and everyone is welcome to join for 100-200baht per meal. The evenings include bonfire and homemade music. Take it easy. Thapwarin Resort  On the beach, upper class air-con bungalows between 1,400-5,500 baht. Good restaurant. This page was last edited on 23 April 2015, at 22:23.